Sarah Boone narrowly escaped the inferno that claimed her family and her home. For months now, she’s been on the run with a secret that will soon be impossible to hide. But the clock is ticking, and she needs a place to settle down soon. She never expected to find the love of her life running a funky, little place called the Blue Moon Saloon. He’s darker and more dangerous than ever but somehow more vulnerable, too. Does she have it in her to be the woman her world-weary warrior needs most of all? Behind the doors of the Blue Moon Saloon, alpha shifters confront their darkest fears and their deepest desires. Each book is a complete stand-alone story - no cliff-hangers! A paranormal romance with adult content. 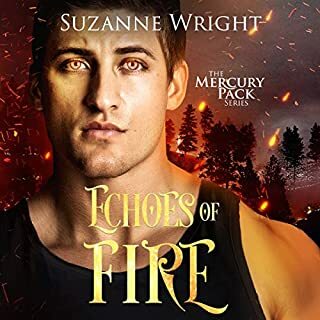 The perfect listen for fans of strong heroines, alpha heroes, werewolves and shape-shifters, red-hot cowboys, romantic Westerns, paranormal suspense, action-adventure romance, and fantasy romance! So far l havent read a book by this author l havent liked. Her characters strike a cord in your heart and before you know it your so involved in their lives and reaching for the next story. There are 6 stories in blue moon saloon series, all will leave you feeling happy. This book, the third in the series brings completion to Soren's story. Sorin and his brother Simon both moved to The Blue Moon Saloon after their whole clan/family were murdered, burned alive, by The Bluebloods a group of fanatical killers determined to stop shifters mating outside their own species. But Sorin didn't only lose his family he lost Sarah, the human, who was his Destined Mate. Many months later Sorin gets his second chance at love and happiness when Sarah gets off the bus just outside the Blue Moon, she's thin, she's frightened, she has scars after trying to save her parents from the fire which killed them. Sorin is both shocked and elated to see her alive but then he notices something which could change everything - Sarah is pregnant and there is no way the baby could be his! What a mess of emotional trauma. Good Narration. The humour, sadness and emotion really do come across in the audible version. Loved the humour of Soren’s bear worrying. (chewing on his claws) LOL. You also really understand the feelings these two are going through. What a mess of emotional trauma. Kindly gifted this audible story. MS Lowe is going to kill me with suspense. I have waited what seems like ages for this story. We get one hell of a teaser at the end of book two, but then we have to wait until over 50% into this book until we hear what happened to Sarah over the past year and how she got pregnant. Now there is suspense in a book, but this was torture. I kept trying to read faster and snarled at anyone interrupting me. What a sad story for Sarah, she has been through so much since Soren broke up with her and left. Soren was an idiot for dumping her and had no right to act wounded, but he is a male and they make no sense most of the time. Unfortunately, Soren is a very quiet bear and hardly says anything, even when he has the chance too and at the end he still had not explained to Sarah why he had broken up with her and left her and what had happened. We know from reading the books but Sarah never had it explained to her. Unless Janna and Jessica told her. Hmm, that’s what was going on behind closed doors. Loved that Sarah held her own when trouble turned up. Good girl. So glad Soren and Sarah have their HEA. Then at the end of this book MS Lowe gives us more to keep us on tender hooks for book 4. She is the mistress of suspense. If you are a fan of Ms Lowe you will love this. If you have read nothing by her before, read this series, you will not regret it.